DOUMA, Syria – Standing in line in the courtyard of their school in the capital Damascus, scores of Syrian girls in pink and blue uniforms saluted the flag and sang the country’s national anthem. A few miles away in a suburb, children played in the courtyard of a rehabilitated school, where shattered windows were replaced but charred walls and pockmarks from bullets remained on building facades. “This is to reaffirm that we have reached victory phase … which means things should settle down, including in education,” Education Minister Hazwan Allwaz told the pro-government Al-Watan newspaper in comments published at the opening of the academic year Sunday. The war is far from over, however, and its devastation has been particularly scarring for the country’s children, including those who fled the conflict, Geert Cappelaere, regional director of the U.N. Children’s agency UNICEF, said. Loss of families’ livelihoods, pervasive poverty, trauma and continued insecurity – even in areas where fighting has ended – as well as severe aid funding cuts are among the biggest obstacles facing Syria’s children. In northwestern Syria, where the government is threatening an offensive in Idlib province, 1 million children – many of them already displaced more than once by the conflict – are bracing for a bruising military campaign. Allwaz, the education minister, said UNICEF has cut assistance to students – including a million school bags – “under the pretext that international funding has dropped,” he said. Some of the cuts were a reaction to government restrictions on his agency’s access, Cappalaere said, including access to areas recently captured from the opposition, or independent monitoring of spending. “There is a big turnout” now that the fighting has ended, said Malak Rislan, principal of Seif al-Dawleh elementary school. Many schools offer morning and evening sessions to accommodate the growing numbers. In Lebanon, the country with the world’s highest concentration per capita of Syrian refugees, the cuts meant 20,000 children have lost informal education, homework support and basic school rehabilitation. More than 55 percent of the 1 million Syrian refugees registered in Lebanon are children. “We are concerned about what we call negative coping mechanisms, a decision taken by extremely vulnerable families – for example, early marriage, child marriage and child labor,” Jenkins said. In December 2017, Jordan’s Ministry of Education reported that 31 percent of school-aged Syrian refugee children were not receiving formal or non-formal education. Child marriage has also increased in recent years – 2016 Jordanian religious court data shows that 36 percent of registered Syrian marriages in Jordan involved a girl younger than 18, four times more than in 2011. In Amman, two brothers were searching through a pile of trash for scraps of metal to sell to Jordanian factories. 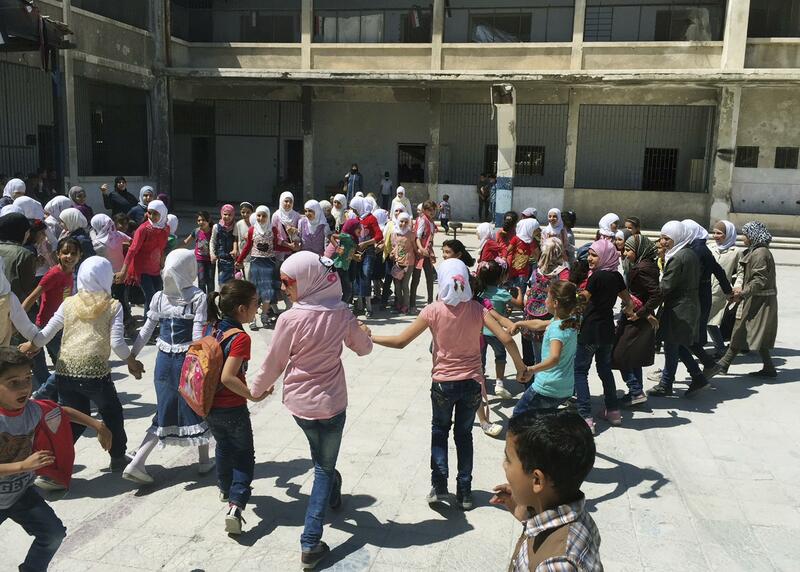 The 17- and 18-year-olds had dropped out of school since 2013 when they fled their hometown in Syria’s Homs. With a disabled father, they are their family’s main breadwinners, earning at most one Jordanian dinar ($1.40) a day, enough to buy bread. In their home in Amman’s Jabal al-Nasr neighborhood, their mother Elham Sada wept. Her 10-year-old daughter, in a pink shirt that read “Mommy’s Little Princess,” knelt next to her. Without the U.N. money, Sada said her kids won’t make it to school. “We are too afraid to go back,” he said. Published: Sept. 7, 2018, 12:06 p.m.